This post will be updated continuously during the next 7 days. For more details see here, but in short – come back every day to read something new I added for the day, see what perfume I chose to wear and share your SOTD. I know that there are some “lurkers” who follow the project but do not comment, so if you’re reading this, I invite you to join the conversation. Week 1 of the Month of Irises went by quickly. I was glad to see all of you – with daily updates on your SOTD and just because. I urge all of my loyal readers and friends to participate in the topic even if you are not wearing iris perfumes – this month or in general: irises are just an excuse to do this daily exercise with updates but the main goal is to see all of you more often (but Rusty clearly votes for more irises). One of the silent (on this blog) participants has mentioned that Ormonde Jayne Orris Noir reminded her of Ormonde Woman. I intended to wear Orris Noir this month anyway but now I’m very curious to check also if I notice the same resemblance (beyond Iso E-Super that Geza Schoen and Linda Pilkington seem not to be able to get enough – not that I complain about that when it comes to their main line). Orris Noir that I wore yesterday was nice and warm. As I was wafting it throughout the day, I thought that, while not the most complicated compared to many other niche perfumes that I’ve tried since I first liked and bought Orris Noir, it was not like anything else that I knew… And then I got home and remembered to try Ormonde Woman. They do not smell completely similar to my nose, but you can definitely tell that they are related. It’s not a riddle in the strict sense of the word since there is no real right answer but there’s an answer that I want you to find. So do not get discouraged if you do not “see” it. Does this picture remind you of anything related to this month’s theme? So, not really riddles fans? Oh, well… I’ll try to post an additional “clue” during the day but if still no, I’ll stick to pictures of Rusty. Ramon Monegal Impossible Iris – I’m curious to check how it smells on me in this weather: I don’t remember ever getting the rooty-ness that hajusuuri reported yesterday. Though, I have never had a chance to wear it in a cold weather. Most of my today’s readers were here already for this post, but for several new comers I’ll post the link (there’s a nice music clip in there – in case you’re up for some music and film references) – Mission: Impossible Iris. Last year I took that picture with one red flower amongst white ones because it looked surreal. My friends and I discussed for a while how it could have happened. 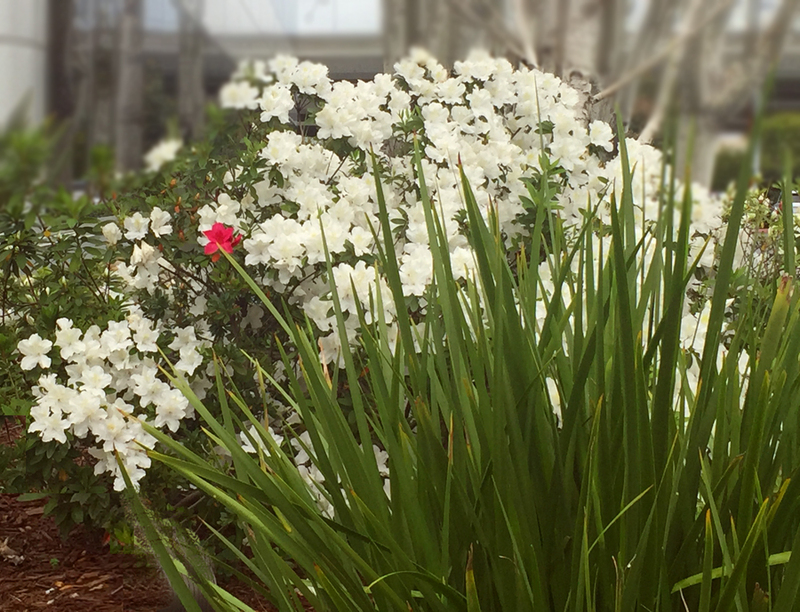 There were multiple theories, some very elaborate about how these flowers have that strange mutation when one of them comes out in another color… 2-3 weeks later, once the white bloom was over, the bush that grew next to it burst out with… all red flowers. And I realized that there was no genetic mutation or some other unexplained phenomenon: that single red flower just came out “before his time” – and that’s why it was so noticeable and misunderstood. 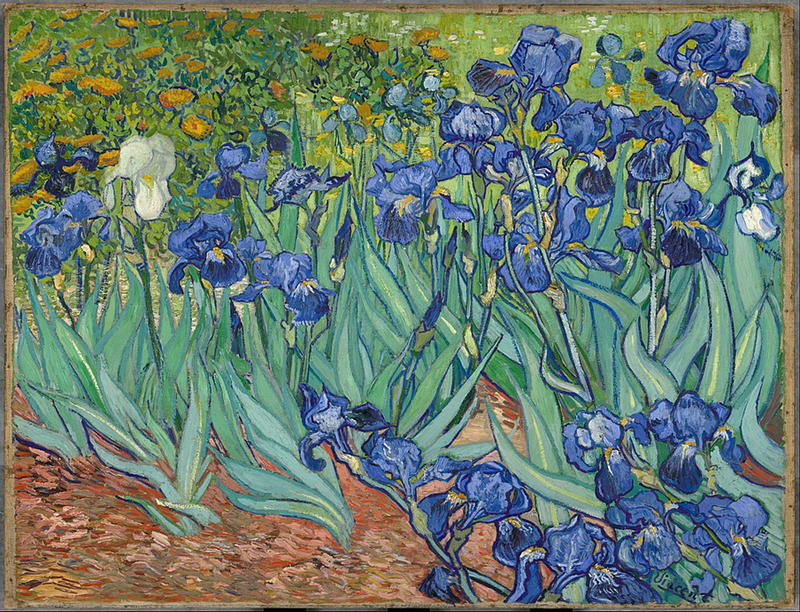 When I recently looked at my picture, it reminded me of this Vincent van Gogh painting with a single white iris surrounded by a more traditionally colored irises. I plan to wear Iris Poudre by Frederic Malle. I wonder: will I experience déjà vu all over again? For my birthday I’m wearing Armani Privé La Femme Bleue. HdP Opera Collection 1904. Asali (The Sounds of Scent) posted a wonderful review for this perfume. On the last day of the Week 2 the SOTD thread is hosted by Tara on her wonderful blog (as if it requires any introduction) A Bottled Rose. Please visit her most recent A Month of Irises post, read her musings on some wonderful iric-centric perfume and comment there on your SOTD, whether you wear an iris perfume today or not. Happy Valentine’s Day to those who celebrates! This entry was posted in "Four legs good", Favorite Perfumes, Single Note Exploration and tagged 1904, Frederic Malle, Histoires de Parfums, Impossible Iris, Infusion d'Iris Absolue, Iris Poudre, Ormonde Jayne, Orris Noir, Ramon Monegal. Bookmark the permalink. Playing with iris flower, so cute! Yeah, first week passed quickly and it's a lot of fun. Today I am wearing Heeley Iris de Nuit. Heeley is one of the brands with which I’m not too familiar. I don’t even know why since at least one store, which I visit 2-3 times a year, carries the line. I’ll make sure to smell Iris de Nuit the next time I see it. I would be curious to know what you think of Iris de Nuit. I didn’t like it the first time I tried it and gave away my sample. Then the sample returned to me years later and I had different feelings about it then. Checking in for day 8. I will continue under my first comment to keep all my entries close to each other. Read a lot, haven’t tried yet. Looks like my comment got swallowed up. We’re twins today! Time to check-in for day 11. So this Sunday I’m wearing Lye from Gabriella Chieffo. It’s an incensy iris. And we’ve reached day 12! Because you wrote about Armani Prive in your guest post, I’m wearing Iris Celadon today. Sorry Hajusuuri, we’ve missed each other this time by a day. We’ll be house twins today. I plan to wear La Femme Bleue. Happy Valentine’s Day to those who celebrate. It overlaps with Ash Wednesday this year and that’s a more important thing for me. I’m wearing Van Cleef & Arpels Moonlight Patchouli. You could always go for iris in a supportive role. Missed the 1st week, but I should tune in for the second! I am wearing Hermes’ Eau de Gentiane Blanche yesterday and today. It is a scent of snowdrops for me, and I am remembering my Granny who passed away last year on 7th February… I was on the quest for a snowdrop scent for several months last year, and this one appeared pretty realistic! But Gentiane Blanche claims to have iris in the composition. Must not be orris butter, but more like a combo of synthetics to render the smell of dewy morning iris blooms. Bitter, green and waking from the ‘gentiane’, but creamy and soft from the other compounds, it can get closer to Hermes Hiris, and Hermessence Paprika Brasil for some noses, but is not as complicated. Very clear and meditative fragrance. One of the most minimal of Jean-Claude Ellena’s creations. Rusty is a star! As always. I’m glad you’re joining us for the second week. My sympathy on your loss: my Grandma passed away 16 month ago, and I still miss her acutely. Thank you, dear! My condolences for your Granny, as well. It is always with a warmth in our hearts when we remember them. And actually it is а remembrance day today in my country – a week before the start of the Fasting. Eau de Gentiane Blanche is not my daughter’s favorite – she says it smells of bitter plants, and wrinkles her nose. But I experimented and gave her to sniff it after an hour, without telling her what it is, and she liked the drydown, suggesting it smells of clean towels and some “nice little flowers”. I guess she is right, and I am grateful to all the people who advised me about it. By the time your daughter grows up, she’ll know everything about perfumes – and then some :). Oh my goodness it looks like Rusty is sniffing the flower at the end of the GIF! Love it. January was the slowest month ever but I suspect February will be the fastest. I’m wearing Cuir de Russie today with its leather and iris. It’s nice at a distance but I don’t regret giving my bottle to the Cookie Queen. What do you mean “looks like”?!! He was sniffing the flower! :) That was one of the reasons I picked that clip out of several where he was catching the flower and playing with it. I need to wear Cuir de Russie – maybe not for the project but just because: I haven’t worn it in a while and miss it. Today, I’m wearing a sample of Iris Absolute by Washington Tremlett. I don’t know where it came from but think you’d like it. A baby powder iris with a bit of a vintage feel. I’ve never even heard of this brand – perfume-related or otherwise. It’s a little funny – your sample’s autogenesis. I’m sure we all have a share of those mysteriously appeared samples. I’d never heard of them either! An old bespoke shirt tailor apparently. They made a good perfume anyway – wherever the sample came from. I could wear Cuir de Russie! And I do think I have and like Orris Noir. But where? Rusty with the iris, priceless. Reminds me to video Truffle with grapestalks. Better than catnip! Spraying Hiris (8 sprays?) should definitely help with longevity. But I’m not getting any more until I’m done with my mini bottle. LOve the Rusty pix!!! I am wearing Fazzolari Feu Secret. Thanks! He was rewarded for cuteness. I keep reading great things about Fazzolari Feu Secret. I’ll get to try it at some point this year. I am a year too late as I ‘can’ only wear rose at the moment. Ce soir ou Jamais today. Rusty is too cute! I am an Annick Goutal fan but I don’t think I’ve ever seen that perfume or tried it. Thank you! I’ll try to find it somewhere closer to home since it feels a little excessive for a sample to travel half of the world just for me to try. But I appreciate the offer. That gif of Rusty is the cutest thing. I’m participating today in Iris Nazarena! 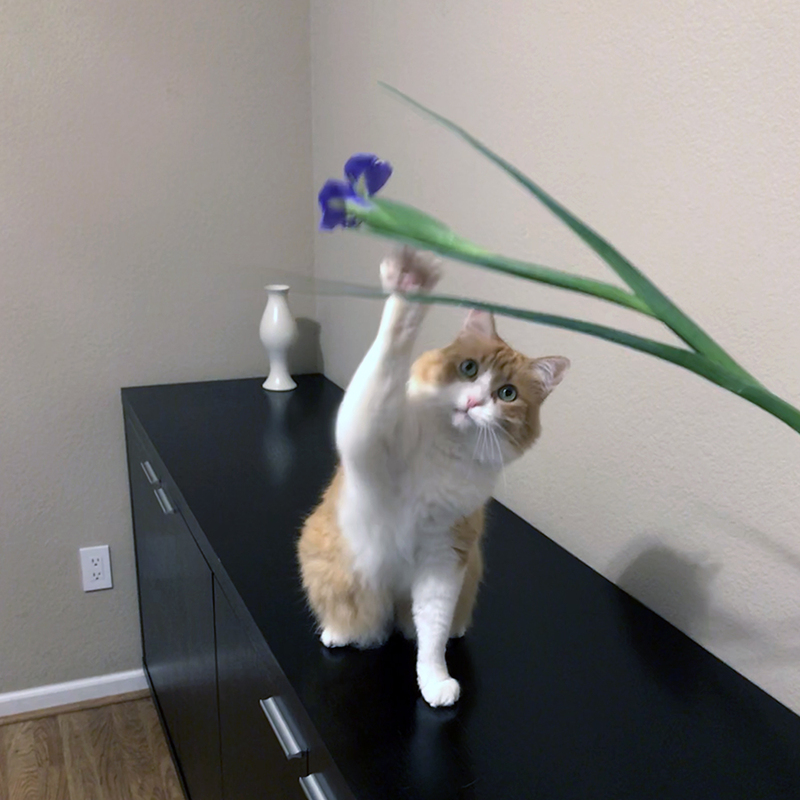 I took “live pictures” specifically to be able to find a good picture or two of Rusty playing with the flower. But when I went through all of them, I realized that I just had to share that flower sniffing moment. The next time I see Iris Nazarena at the store I will give it a try – you’re the second person who wears it this month. Quite masculine – the name says it all. On me it is lavender-Iris-vetiver. It packs a wallop so only 2 spritzes was enough. I initially red the bottom section as GIFT of the day and indeed it was. That Rusty starred in his own little movie. How cute! I don’t think I’ve ever smelled this perfume for the stupidest of reasons: I do not like those bottles so I never even considered it for my vSO (and for myself I rarely smell masculine mainstream perfumes). Does it make any sense for me to go to a perfume counter now, or is the one that you have “vintage” that since then was completely butchered? Mine was from 2 years ago so newish. I’ve never smelled the vintage. There are many flankers which don’t hold a candle to the EDT. He is my favorite cat too (unless it’s 6 a.m., and he starts meowing outside of the bedroom door complaining that he’s lonely, hungry and who knows what else ;) ). Goutal Mon Parfum cheri par Camille today. I have only a tiny sample of this…. on first try it was too much patch for me (so it fits the NST community project, too!) I am really liking it today in the cold. Might need to obtain a decant! When that perfume was first released, I wanted to like it so much: the bottle was so beautiful, I wanted to have it in my collection. But it didn’t work on my skin at all. And now it comes in the standard plain bottle – so I’m not tempted any longer. But I know that many people liked it back then. Friday 2/9 SOTD: Sencha Bleu! I haven’t tried it but it has all the notes that I like. It’s very pleasant. I don’t really smell hyacinth, except for the green freshness; the iris is stronger to my nose. Delurking to report for week 2. This week I wore 3 iris-centered perfumes: 28 La Pausa, Orris and Sandalwood and Xerjoff XJ Irisss. I also wore 2 that list iris as notes but it plays a supporting role: Tauer’s L’eau and Escentric 2. I smelled great every day except today – the Xerjoff is stinky on me. Hello tp Undina and to everyone, I’m enjoying these posts and comments very much. Yesterday I wore l’Heure Bleue edt and enjoyed it after staying away for many months. An attempt to wear it in the heat of summer did not go well. It was a relief to find it smelled great again. It has a subtle iris, to my nose the other flowers are more prominent. This evening I’m wearing a sample of Parfums DelRae Mythique in harmony with the Friday NST challenge. Mythique is a strange and interesting scent. It pushes at the limit of tolerable muskiness for me, but still hangs together nicely as a perfume entire. I hope that makes sense. Over years, I tried Mythique several times and drew to dislike it. Now I’m thinking: can it be that my sample had gone off and I didn’t realize it? Because initially it was OK though not interesting in the opening but I liked the drydown. And in the end, as I see from my last note, I decided that I should stop testing it. hi Undina, the iris in Mythique is very nice, but overall it is not a scent I will wear often. It might be worth sniffing again if you ever have the chance to see if your sample had gone off. I’ve added Purple Rain, Apres l’Ondee, and Wrappings to the list of scents with iris I’ve worn in February. Twelve days, still going iris-strong! I think I have a sample of Apres l’Ondee – I’ll keep it in mind if I decide to substitute one of the planned scents. I think you clued me in to the discount except you got free shipping and I didn’t. Impossible Iris is a chameleon and performs differently in the heat than in the cold. Today, it was rooty and effervescent! You have good memory! It was exactly as you remember – and I still wish we got that free shipping for you as well (I remember that it was tricky, I had to watch carefully through the order placing process to get it). I should wear it tomorrow – just to see how it works in February. The front leaves of your picture looks like iris leaves, I think, but then again, I’m pretty useless with real life botany. Ombre Mercure was as I remembered, nice, but somehow not really good enough. You’re thinking in the right direction. I’ll try to add a better clue later. Right direction, but not the up coming leaves of the iris… hm, can’t think. Oh, and before I forgot: Happy Birthday! May all your perfumes promote only the right mood and suitable colors (not darker than a violet-colored very fleeting melancholy)! Thank you ❤️ I ended up with Shem El Nessim, though afterwards it hit me I should have worn l’heure de nuit which is the happy l’heure bleue. One spritz before my hair cut appointment so I anticipate being back with Day 10 Scent 2. Hair freshly cut and I am now enjoying the last sips of my quadruple shot Caramel Macchiato (fear not, it was half decaf). – woman enters looking for a table. It was early enough so 3 out 6 2-tops were open, and the entire family style table in the back. – woman orders a very complicated nonfat sugar-free no whipped cream drink (why bother if she doesn’t want any of the good stuff? ), gets drink, places her drink on a more private table that someone reserved with a newspaper. – newspaper guy comes with his drink, tells woman that he had reserved the seat but was ok moving. Woman moves away. – A minute later, a guy walks in, asks if she’s so and so and she says yes, hi, nice to meet you. ; would you like to get a cup of coffee? I wonder how that blind date went? You can get an espresso shot with decaf coffee? Wow, I have never knew. It is funny how particular you are with your drink. I even went to check the caffeine content in different Starbucks drinks (and now I want coffee! :) ). Are you sure it was a date? I can’t imagine people arranging to meet for a date with an approximate location (that requires to call and re-confirm where someone is) or not finding our whether both parties are fine with coffee/tea. Where would they go from there? Bizarre. I’m too old for that sh*t.
Though, if to think about it, “in old times” people used copy machines for that type of “jokes”. Hello-one of your silent readers here, who is really enjoying your month of iris. What is the beautiful piece of fabric, under the first iris post? With M. Rusty sitting at the table? I love it. I used lots of Iris Silver Mist, in keeping with your theme. Why do people think this smells cold, or carroty? I think it smells delicious and divine. There is something about all iris fragrances that seem elegant to me. Roses are magnificent, peonies are so cheerful-but iris cannot fail to be elegant. I love all sort of iris. They grow wild here. Once I came around a turn in the road and there was an entire field of them. I have never seen anything so beautiful. These iris tend to be smaller and deep dark purple. The smell is delicate and they grow in almost swamp like terrain, so i associate them with the smell of the earth they grow in. I have an orange cat too-his name is Marmalade. His fur is nowhere near as elegant as Rusty’s fur-Marmalade has a funny loping walk. Almost a strut. When I reach down to pat him he stands on his hind legs to make my job easier. And he uses his paws like hands, and will sometimes reach up and touch my face to express affection. Hi Carole! I’m glad you stopped being a silent reader (though I appreciate that kind also). Your story about Marmalade made both me and my vSO smile: your cat seems to be very affectionate, and we both like when cats aren’t aloof. Do you have his ictires anywhere to share? The fabric you saw is a silk scarf with the same picture as I posted today as a riddle answer :) A friend gifted it to me, and I like it very much. I agree that iris perfumes are elegant. But some of them do have that carrot-y aspect, which I do not mind – same as coldness of some of them (unlike with cats, I don’t mind some austerity when it comes to perfumes :) ). Growing up we had cats but none were orange cats like Rusty and Marmalade. I used to have a matching set-Henry and Marmalade. Both orange, both gorgeous. But Henry went missing this summer. I’m still heart broken over it. He was a huge cat-a big strong tabby, with a super affectionate personality. He was scared of everything. I saw him that morning, and when he didn’t come home for supper, I knew I was in trouble. I live in hope he’ll reappear. This is from a split with clarissa. It is a very nice, leaning masculine, musky, powdery iris. I could rock this in all seasons except summer! I like it but I just don’t need 100 ml of it. It would have been lovely in a 20-30 ml bottle. I don’t think I tried this perfume. Should I? Do you really-really like it? I’m trying to think of anything for NST’s project: so far – not a single idea even without limitations of it being an iris-centered perfume. Lucas has a perfect sample for NST’s Friday – A Bulldog in the Atelier (or something like that) – but it doesn’t have iris in it. Definirely worth a try! U mentioned “dusky@ and should have clarified that it neans (to me) powdery amber. I got off track due to family and travel obligations, but today I am in Iris Ganache. Happy Birthday, Undina! I hope it was a delightful day for you. I wore another big dose of Apres L’Ondee this evening. It suits my mood and the cloudy weather perfectly. It smells more of heliotrope for me though I know the iris is singing in the floral chorus. I love it. I had wonderful two days – thank you! Now I should go back to the “real life”. But at least I have many great perfumes to help me through the week. My SotD is Vanilla d’Iris by Ormonde Jayne. It’s still not for me as it’s too sweet for my taste, but it’s not as indolic as I remember. I plan to wear it soon (from a sample) but I wasn’t in love with it when I tried it last time. Insolence edp today. That violet hairspray note always cheers me up. I’m not sure if I ever tried this perfume but I know that many people like it. So good to see Rusty doing his cool thing for this theme, Undina! My SOTD: Atelier Cologne Silver Iris. Looking forward to sniffing Atelier Cologne’s new Iris Rebelle. I liked Iris Rebelle: it’s a very cheerful iris. Then I must definitely hunt it down, Undina! I also am wearing Silver Iris, which was my wedding day perfume. I just realized that I missed this comment. Sorry! Silver Iris is a great choice for the wedding. Love both of these. The Prada was theow first bottle I deliberately bought at the largest size available. I was going tio “save” No. 19 to wear on the 19th and I thought why wait? Wear it now! I like your idea for No 19. I can totally do it! So far I’ve worn only the EdT, and in my schedule I still have EdP, extrait and Poudre – so I’ll wear one of them then. I should get d’Iris Absolue soon: you never know when it gets discontinued or, worse, reformulated. Thank you, Julie! It was a wonderful birthday.